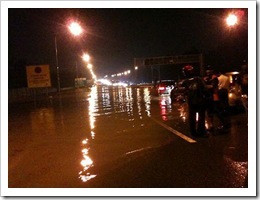 I was stuck at PLUS Highway Seremban-KL while heading to Seremban, this evening due to flood. The traffic was so bad as many cars were stopping at the road. It started from the city southbound before the Sungei Besi toll. The jams was so bad and caught me by surprise. I wonder why the PLUS officials never stop the cars from heading to PLUS Highway Seremban-KL. PETALING JAYA: Hujan lebat yang turun lewat petang Selasa menyebabkan kejadian banjir kilat melanda sekaligus mengakibatkan kesesakan lalu lintas yang teruk di beberapa jalan utama di Kuala Lumpur, Serdang, Bangi, Nilai dan Kajang. Laluan trafik sangat perlahan dan adakalanya tidak bergerak menghala ke selatan bandar raya hingga sebelum tol Sungai Besi. Kesesakan tersebut menjadi lebih buruk di Jalan Istana hingga ke pangkalan Tentera Udara Diraja Malaysia Sungai Besi akibat banjir kilat yang berlaku. Pada kira-kira pukul 9 malam, PLUS Expressways Bhd (PLUS) membuka laluan alternatif sebelum laluan tol bagi membolehkan pemadu membuat pusingan ‘u’ untuk kembali ke bandar raya. Sementara itu, di Lebuh Raya Besraya, banjir kilat yang berlaku dihadapan Stesen Keretapi Tanah Melayu (KTM) Serdang menyebabkan kesesakan yang teruk sekitar, Hotel Palace of The Golden Horses, Mines dan Balakong dengan hanya satu lorong boleh digunakan. Kesesakan turut berlaku di hadapan bangunan Minlon menghala ke stesen KTM Serdang. Paras air naik di KM303.8 laluan Universiti Pertanian-Kajang yang memaksa laluan di kedua-dua belah jalan tersebut terpaksa ditutup. Di Lebuh Raya SILK, banjir kilat melanda sekitar Bandar Sg Long memaksa jalan menghala ke Cheras dan Kajang terpaksa ditutup dan trafik dilencongkan ke Putrajaya. Di Lebuh Raya KESAS pula, kesesakan bermula di Vista Komanwel menghala ke MRR2, Lebuh Raya Utara-Selatan menghala ke Sri Petaling. Downpour causes massive jams on several major roads in Klang Valley. PETALING JAYA: An evening downpour caused flash floods that snarled traffic for hours on several major roads in Kuala Lumpur, Serdang, Bangi, Nilai and Kajang. Houses and cars in low-lying areas in Kajang and Serdang were submerged in waters at the height of the flood. Floodings were also reported in several housing estates in Kajang Heights, Country Heights, Sungai Ramal Dalam, Taman Sri Serdang, Serdang Jaya and Seri Kembangan. Traffic was slow, at times at a standstill, for those heading out of the city southbound before the Sungei Besi toll with the jam stretching to Jalan Istana and TUDM due to the rain and floods. At about 9pm, PLUS officials opened an alternative route before the toll plaza to allow motorists to make a U-turn back to the city. On the Besraya Highway, floods in front of the KTM Serdang station caused congestion around the Palace of the Golden Horses, Mines and Balakong with only one lane accessible on many stretches. A bottle neck also occured in front of the Minlon building heading towards the KTM station. The water level rose at KM303.8 of the Universiti Pertanian-Kajang route forcing both sides of the road to be impassable to traffic. On the SILK Highway, floods around Bandar Sg Long forced the road to Cheras and Kajang to be closed and traffic diverted to Putrajaya. On the KESAS highway, the crawl started near the Vista Commonwealth heading towards the MRR2 and the KL Seremban Highway towards Sri Petaling. Massive congestions were also reported in Subang Jaya around the Pesiaran Kewajipan roundabout and Sunway areas, NPE and on the SPRINT Highway. This entry was posted on Wednesday, September 5th, 2012 at 12:54 am	and is filed under General. You can follow any responses to this entry through the RSS 2.0 feed. Both comments and pings are currently closed.